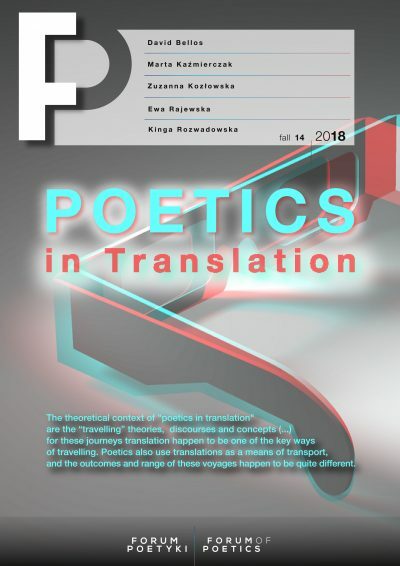 – is a variant of the so-called “academic” or “campus novel” that is popular in Anglophone literary culture and makes sporadic appearances in Polish literature. The defining feature of this (thematic) genre is campus life:1 into this setting, the academic murder mystery introduces the crime motif (typically involving murder) and the narrative thread of the investigation that then ensues. This can take the shape of two possible narrative models: either the crime has occurred within the academic setting while the investigation is led by someone from the outside world, or the leading figure is an amateur detective (often female) who is a scholar by trade (often of literature). The Inspector Morse novels by Colin Dexter (1930-2017) are an example of the first strategy. Their hero, Endeavour Morse, is a police inspector from Oxford, and many of his investigations concern crimes committed at the college. Such is the case in Death is Now my Neighbour (1996) and The Daughters of Cain (1994). Dexter’s novels have been adapted into a popular television series on the British network ITV. The second strategy is mobilized in the novel Gaudy Night (1935) – a brilliant example of the so-called Golden Age of the British detective novel2 and a precursor of the academic murder mystery, written by Dorothy L. Sayers (1893-1957). Sayers was a philologist by training (receiving her degree in classical philology, modern languages and medieval literature at Oxford’s Somerville College in 1930).3 Sayers earned her place in the history of twentieth-century British literature not only as the author of crime novels, but as an excellent poet, translator (of the Song of Roland and Dante’s Divine Comedy, among other texts) and essayist on themes of theological philosophy. The protagonist of Gaudy Night (the title refers to the university tradition of organizing gatherings for graduates, while the word “gaudy” comes from the song “Gaudeamus Igitur”) is Harriet Vane, a female detective and crime author who appears in four of Sayers’ novels. The most consistent amateur detective of her books, however, is Lord Peter Wimsey, featured in a dozen or so novels and several short stories. Vane and Wimsey are caught up in a complex emotional dynamic and simultaneously compete with one another as detectives. In Gaudy Night, Harriet is approached by her former advisor from an Oxford college to help shed light on a series of unfortunate events unfolding on campus (anonymous threat letters, acts of vandalism). Under the pretext of researching the work of Sheridan le Fanu – yet in actuality, pursuing the perpetrator behind these deeds – Harriet spends a few months at the college. In the book, this becomes a chance for Sayers to depict the nuances of academic life and the complex and toxic interpersonal relationships endemic to this environment. In the end, however, it is not Vane who solves the puzzle but Peter Wimsey, and the novel comes to a close with Wimsey asking for her hand in marriage and the resulting wedding. In spite of the novel’s seemingly conventional ending, the theme of the women’s struggle for independence and the right to education actually occupy a major place in the novel. As a result, Gaudy Night has often been hailed as the first feminist crime novel. The core themes of the academic murder mystery define the remaining features of this genre variant. The focus of the action is either an individual hero leading the investigation, or a collective hero (the academic community). The novel plays out within the space of the college grounds, on a circumscribed campus or at the venue of an academic conference, for example. The settings often include the private apartments of lecturers and students. By way of this spatial dimension, the academic murder mystery becomes a new incarnation of the English “cosy mystery,” brought to fame by the work of Agatha Christie and the television series Midsomer Murders, based on the novels of Caroline Grahams. On a temporal level, the action conforms to the specific calendar of the academic year. One idiosyncrasy of the academic murder mystery that binds the variant to the campus novel while differentiating it from other subgenres of crime fiction consists of its common and semantically oriented layer of intertextual references and allusions to academic themes (theories, methodologies, research projects). Showalter’s study came out in 2005 and limits its focus to English-language publications. At the turn of the twenty-first century, however, the academic murder mystery subgenre expanded rapidly, and today, the roster of authors who fall in this camp has grown long. The art historian Christine Poulson, for instance, left behind her promising academic career at a Cambridge college for the profits she was reaping with her crime novels about Cassandra James, a literary critic who unravels the mysteries behind crimes committed at Cambridge. Allen Simpson, a scholar of Scandinavian Studies at the University of Minnesota, writes crime novels under the pseudonym M. D. Lane. His novels play out in the domain of his home university, and the lead investigator is a female campus security officer. It is also worth mentioning Anne Fleming, a scholar of English Romanticism, whose novel Death and Deconstruction (1995) explores a murder committed during an academic conference at Norman Abbey, a monastery described in Canto XIII of Lord Byron’s Don Juan. The American writer Sally Wright’s crime novels, in turn, feature the protagonist Ben Reeves, an archivist (who also happens to be a World War II veteran). In Publish and Perish (1997), the opening novel of Wright’s series, the archivist solves the riddle behind the sudden death of his close friend – a professor of literature. The examples above are by no means exhaustive. One thing is certain – in the academic murder mystery world, women take the lead as both authors and heroes. To offer possible explanations for this phenomenon would require a standalone article. This being said, I should add that the first Polish contribution to the subgenre is also the work of a woman author. The debut novel of Professor Zofia Tarajło-Lipwska, a scholar of Bohemian Studies at the University of Wrocław, is written in the style of the satirical grotesque and titled Death of a Dean. Down In the Well of Bad Feelings (Śmierć dziekana. W studni złych emocji) (2014). In this case, the action plays out in the (fictional) Institute of Antiquity Studies at the Kuropaski University in Pasikurowice. The Institute’s Dean, Mirosław Korbieluch, is murdered. As one of the book’s reviewers has noted: “this novel reflects the gray absurdity of campus reality in a distorted mirror.”11 Police commissioner Jacek Cichosz, who successfully closes the case in Death of a Dean, solves the riddle of yet another crime in Kurowice in Tarajło-Lipwska’s most recent novel, Recycling (2017). If we seek some proof that the academic murder mystery can also function as a formula for high literature, we should turn to the case of Umberto Eco’s The Name of the Rose (1980). The book features a medieval monastery equipped with a labyrinthine library where Benedictine monks laboriously transcribe theological and philosophical manuscripts and a dispute over universalisms, calling to mind contemporary methodological debates, yet these tropes merely restage the hermetic space of the academy. In this case, the motives behind the crime are inextricably tied to emotions that run through the world of scholarship, and the rich inventory of erudite intertextual references offers a source of constant pleasure for the reader. 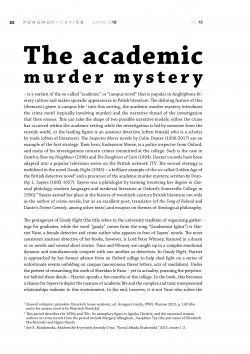 This article describes the academic murder mystery as a particular hybrid of the campus novel and crime novel. The genre began to evolve in the 1930s in English-language literature and continues to enjoy popularity today. Attempts to write in this genre have recently been taken up in Poland as well. 1 Słownik rodzajów i gatunków literackich (nowe wydanie), ed. Grzegorz Gazda, PWN, Warsaw 2012, p. 149 (the entry for campus novel is by Wojciech Nowicki). 2 This period describes the 1920s and ‘30s. Its exemplary figure is Agatha Christie, and the canonical women authors of crime novels from the period include Margery Allingham, Josephine Tey (the pen name of Elizabeth MacKintosh) and Ngaio Marsh. 3 See E. Kraskowska, Akademickie kryminały Amandy Cross, “Nowa Dekada Krakowska” 2015, issues 1-2. 4 See E. Kraskowska, Akademickie kryminały Amandy Cross, “Nowa Dekada Krakowska” 2015, issue 1-2. 5 A. Cross, Death in a Tenured Position, New York 1988, pp. 5, 9. 6 E. Showalter, Faculty Towers. The Academic Novel and Its Discontents, University of Pennsylvania Press, Philadelphia 2005, pp. 68-69. “Our Gal Sunday” is an allusion to a radio soap opera broadcast from 1937 to 1957 about an orphan in Colorado who marries a British aristocrat. The Ivy League – a term used broadly to describe the eight most prestigous American universities, one of which is Carolyn Heilbrun’s Columbia University in New York. 7 Op. cit., p. 71. 9 Op. cit., p. 52.